You know those short wedding dresses I uploaded about a month ago? The ones I forgot to include the mesh with? Well, I've now corrected my mistake and added the mesh to the download. Please redownload over here. There's also something screwy going on the the terrain replacements - under certain circumstances the colours of the 'hood and lot match, and under others they don't. And I'm not sure at the moment whether it's to do with whether a lot is inhabited or not, the season, or the lighting system (Gunmod's Radiance lighting vs. Maxis lighting) - too many factors to compute, and my brain is exploding! Anyway, along with the other fixes - hopefully at the weekend if I can work out what's going on - I'll probably also be releasing a new version of the terrain replacements too. Anyway, once again I'm onto it, and hopefully I'll be able to find a fix. I'll let you all know as soon as I can. It's been brought to my attention by immlegacy (thank you!) 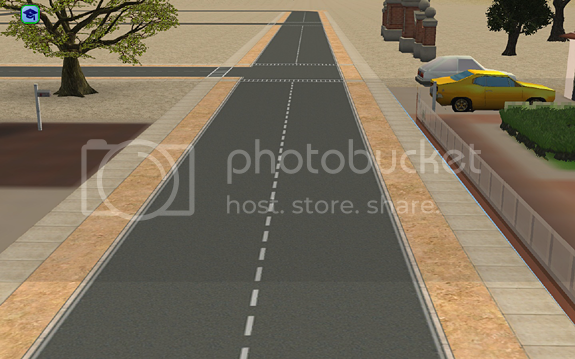 that my neighbourhood terrain replacements don't play nicely with the default Maxis roads in lot view (as shown here). It didn't occur to me to test this, as I don't intend to use the Maxis roads myself - sorry! Anyway, I'm working on a fix for this, so please bear with me! I made a boo-boo. I'm very sorry. If you have previously downloaded my 'The Snake & the Moon' eyeshadows from this year's GoS Advent event, then please go along and redownload them. I noticed last night that they were not layering correctly with eyeliners (they were layering over rather than under liners), but I have now fixed them. Thanks, sorry once again for the inconvenience, and lots of festive felicitations to everyone! I feel rather silly. I only noticed last night that the thumbnails for my default-replacement eyeshadows didn't actually match the colours. Whoops. Sorry, folks! Anyway, they are now all fixed - yay! So, if you prefer your thumbnails to actually have some relevance, rather than just representing a sort of pot-luck, then please re-download your choice of default-replacement sets, here. The thumbnails for the custom set, however, are correct, so there is no need to re-download them.